Description: corticosteroids are known to frequently cause weight gain in patients. This gain is is usually moderate, consisting of a few kilograms of added mass. In addition, corticosteroids enlarge certain aspects of the face. A “moon face” can result, meaning a large forehead and a large chin appear during treatment, accompanied by larger cheeks. 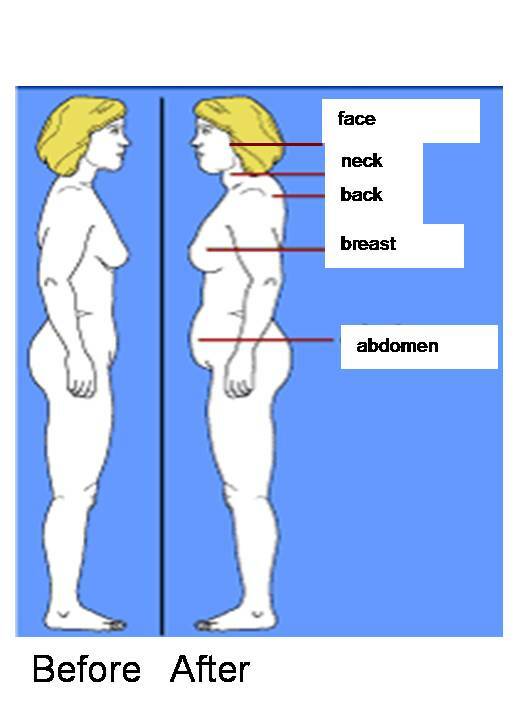 Other gains occur in the neck (“buffalo hump”) and around the waist. These anomalies are due to a redistribution of fat cells in the body (called lipodystrophy) and not because of water retention. Short-term treatment versus long-term treatment: these side effects occur early but usually become visible and bothersome after several weeks of treatment. With short-term treatment, these side effects are often not an issue for the patient. Prevention/Treatment: diet appears to play a role in the development of these side effects. However, it is not the only factor. Your genetic history may predispose you to experience more or less side effects than other patients. In any case, a diet with less calories than normally consumed is recommended. Many doctors believe that a limitation of carbohydrate intake (e.g. sugars, bread) may be beneficial in decreasing the weight gain associated with cortisone use. However, this has never been proved nor demonstrated. Limiting your intake of salt hasn’t proved to be an effective counter-measure to weight gain and lipodystrophy. Once these side effects appear, there are no known effective treatments to stop their presence. Only a balanced diet and regular physical exercise can be recommended. Reversibility: these side effects reverse themselves as soon as the corticosteroid therapy has been discontinued. Lipodystrophy could even begin to disappear as soon as the cortisone dose falls below 10 mg per day. You should make sure you differentiate between weight gain caused by corticosteroids and the weight gain caused by the improvement of your illness under corticosteroids.